What defines a healthy marriage? I am four years into this answer with a human… and 9 years into this answer with a dog. To clear up redundant writing, in this blog I will refer to marriages, partnerships, boyfriends, girlfriends, and any relationship in-between as partner. Back to the original question: What defines a healthy marriage? Let’s throw some adjectives out there that come to mind… devotion, love, trust, forgiveness, patience, time, humility, communication, selflessness.. pretty much that’s it, right? Maybe I should double check with my husband. And if we cross reference that list with how to have a good relationship with a dog, they do come up similar, right? Actually, to me, spot on the same. Is marriage about being joined at the hip every day? Or how about every time you are in the house? Or how about every time you are sitting and watching a movie. Or eating dinner. Or using the bathroom? When does being with your partner become inappropriate, overbearing, frustrating, rather than simple, peaceful, loving, and nice? Can you make a tuna sandwich without your partner leaning over your shoulder, breathing in your ear? Can you take a shower without your partner continually knocking on the bathroom door in an otherwise silent protest to the door being shut? Or can you love your partner, and “Be done” with them while you get a glass of water? Does your partner know that you haven’t stopped loving them just because you are in a different room? Yes. Well, I hope the answer is a yes. So many relationships I see with humans and dogs are very inappropriate. Does the dog REALLY need the human like we think they do? Like we WANT them to? Almost every dog I see come through these doors has a human attached to the leash quoting all the dogs bad behaviors. For a board and train, the human leaves the picture long enough for the dog to throw the human under the bus. It turns out when the human leaves, the dog cleans up- fast. They tell me there is little to no devotion, love, trust, forgiveness, patience, time, humility, communication, selflessness in the house. Wait, how can you say that Kate? I am paying out the nose for dog training. I have bought several hundred dollar’s worth of beds. I have walked my dog after a day of work. I have tried a dozen tools to teach my dog. I tell my dog I love him every day. I kick my human partner out of the bed so my dog can have that spot, so they know I love them. How can you say that? Because often we aren’t giving the dog what they need in dog psychology, but in human psychology. 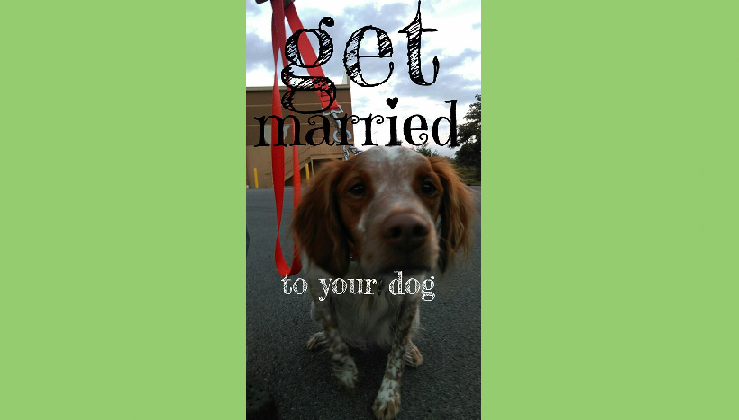 So, get married to your dog. Give them the same respect as you would your partner. The transformation will happen before you know it’s happening.